Yellowstone National Park’s bison population is about to start getting much smaller, as the park has reportedly sent at least 200 bison to slaughter in an effort to cull the winter population by approximately 900 animals. The statistics come from an American conservation group called the Buffalo Field Campaign (BFC), which has traditionally been against the park’s annual attempts at bison population control, pinning the behavior on outdated laws and pressure from the livestock industry. Officials say that the culling of the herd is necessary to ensure that bison infected with a problematic bacterial disease do not transmit it to cattle herds raised by Montana ranchers. According to the BFC, some 250 bison have been trapped by Yellowstone officials over the last week or so. While about 200 have been sent to slaughter, another 55 will likely be sent to be killed on Monday, the group said in a statement. Already, more than 100 bison have been killed by both tribal and Montana hunters, BFC stated. 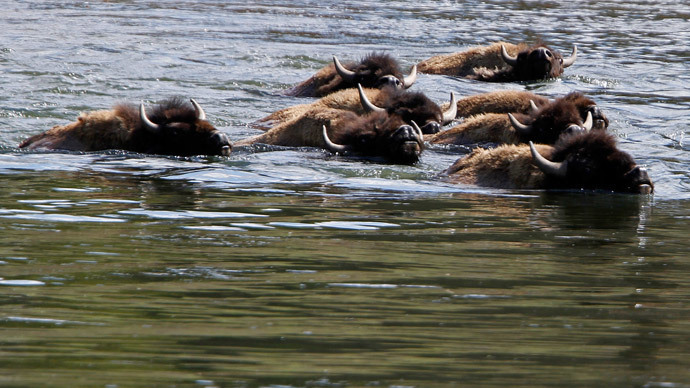 Yellowstone spokesman Al Nash told Reuters that he could not say exactly how many buffalo have been sent to slaughter. While hundreds of bison are scheduled to be killed this year, the culling is part of Yellowstone’s plan to “stabilize the population,” which rose to about 4,900 animals last year. Officials are trying to bring it down closer to 4,000, marking a one-fifth reduction in population. Even that level is high considering what wildlife officials have judged to be their target goal – somewhere between 3,000 and 3,500 buffalo. Although the animals used to live all across the western United States, the famous bison population at Yellowstone currently remains the only free-ranging herd in the United States. Concerns over the transmission of the bacterial disease brucellosis have typically been used to justify the herd’s culling, since the illness can cause miscarriages in cattle. Groups like BFC argue that this argument is overblown, however, and that cases of transmission have not been documented. Last year, the US Interior Department proposed a plan that could potentially reintroduce disease-free bison to large portions of America. The plan proposes moving various herds to external sites and quarantining them for years to keep the brucellosis from spreading. If and when it’s successfully eradicated, the healthy bison would be allowed to freely repopulate other parts of the west.